Management Response Mechanism — Pro-vision Reef Inc. The Great Barrier Reef Marine Park Authority established a Reef Health Incidence Response System to respond to disturbance events at various scales; and to prioritise the allocation of monitoring and evaluation resources. The Reef Health Incidence Response System is underpinned by an Early Warning System, which uses sophisticated technological predictive tools and near real-time monitoring of environmental conditions; plus a monitoring network and site inspections. 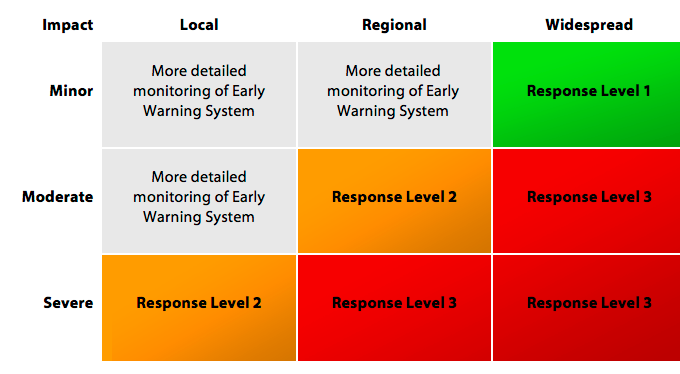 If the Early Warning System indicates an elevated risk of a disturbance event, a scaled Incidence Response Framework is activated. Each increase in Response Level correlates to an increase in severity and spatial extent as well as an increase in management investment and resources required to effectively respond. The matrix below indicates the designation of responses to impact severity over various spatial scales. The Reef Health Incidence Response System establishes several subsector plans, including Fisheries Plans, that are activated at nominated Response Levels. 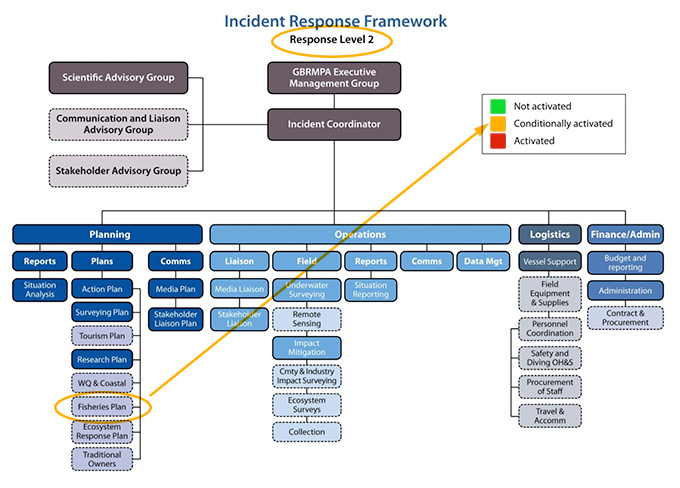 The graphics below demonstrate the broader context of a Fisheries Plan within the Incident Response Framework. Response Level 1 may lead to Response Levels 2 or 3 so the focus is on reporting and situation analysis. 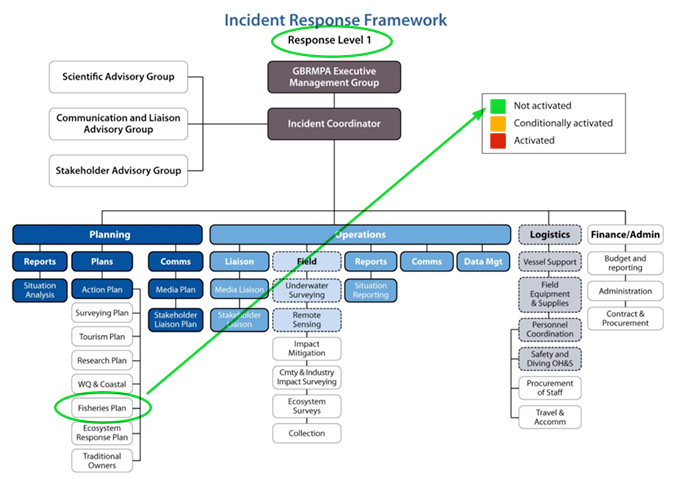 At this Response Level, liaison, communications, reporting and situation analysis are activated but most of the incident response, including the Fisheries Plan, is not activated. At Response Level 2, ecosystem surveys are initiated to characterise the extent and severity of impacts as well as the associated longer-term ecological implications of impacts. This includes mobilising resources to assess the impacts to reef health from the disturbance event. Fisheries Plans become conditionally activated at Response Level 2. 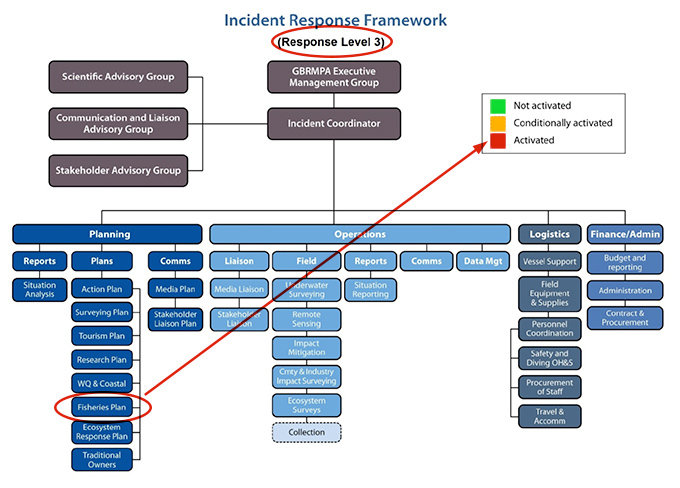 At Response Level 3, the entire Incident Response Framework is activated, including Fisheries Plans.